Chatbots are becoming more popular and many companies are using them in various ways to interact with their customers. Why? Mobile is becoming more important and messenger apps are the primary platform on these devices. A chatbot is a computer program designed to simulate a conversation with a human via conversational interfaces. Instead of using a regular app or browsing through a website you have a conversation with a program. At this stage you can think of chatbots as light-weighted apps. Think of any app that you currently have on your phone and ask how a bot could do the same job. Chat apps will come to be thought of as the new browsers; bots will be the new websites. This is the beginning of a new Internet. Chatbots are a new tool to reach customers and potential clients. The messenger channel is huge. For example, Facebook Messenger has 1.2 billion monthly active users worldwide. This is why it is such a great opportunity. Often prospects ask the same common questions. What is the size of the flats? How many rooms does the flat have? What is the price? Is there a garage? Wouldn’t it be nice to have chatbot to answer these questions and give first level support. In case there is a question the chatbot can’t answer, the bot still can forward the question to sales or customer support. Purchasing a home is an important decision and a big investment. This is why a positive client-agent relationship is important. 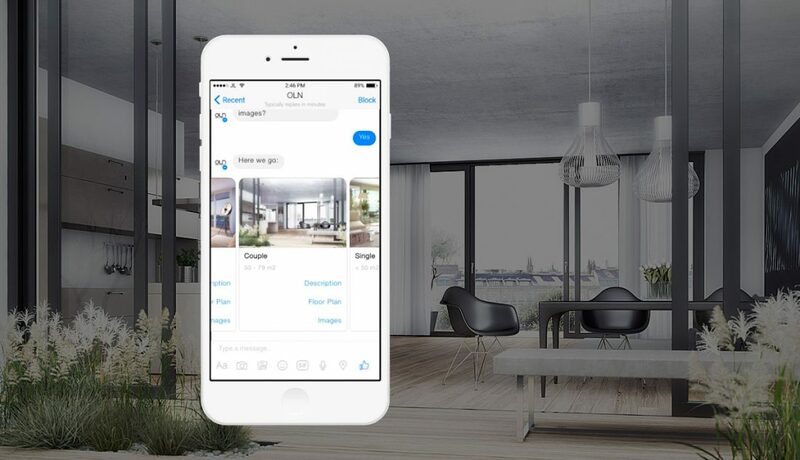 Chatbots won’t replace the real estate agent. They can assist the real estate agent and help to arrange appointments. There will be many more use cases for a chatbot and we are looking forward to the new opportunities. If you have questions about it, reach out to us. We are happy to help.